The Gown About Town event is coming up! We’re going to meet up on Thursday April 4th from 6-9 PM at the Hi-Lo Club. Not only do you get to dress up and drink, there will even be a special cocktail that benefits SFCASA, a volunteer organization that advocates for foster kids. Of course, a gown is optional! But since Gown About Town is all about wearing something you rarely get the occasion to wear, a gown makes sense because it’s certainly something one doesn’t get a lot of chances to wear. You might be wondering where to get your hands on a gown, and since I’ve got an abnormal amount of gown buying experience (I love me a gown) here are some of my recommendations. From prom dresses to wedding dresses, thrift stores are some of the best places to find an inexpensive gown. I frequent both Out of the Closet and Goodwill. At one point, when I was long-term unemployed I toyed with the idea of only wearing cheap wedding dresses from thrift shops. They’re super inexpensive but nice looking, and having that air of crazy around you can really buy you extra space in a crowd. eBay is also a good source for cheap gowns but then you have to factor in the cost of shipping. Here’s a gown I got thrift shopping. It only cost me $15 and it’s one of my favorites by far! By medium I mean less than $400. My favorite gowns are always vintage and the workmanship, fabrics and quality of sewing you get from vintage gowns would cost you thousands of dollars in a contemporary gown. Most vintage stores carry them but these are places in San Francisco where I’ve personally witnessed some amazing ones: Relic Vintage, La Rosa, Static Vintage and Vintage A La Mode. There’s also Chick a Boom Vintage in Petaluma and Juniper Tree in Alameda. 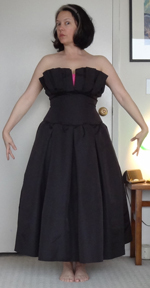 Etsy is hit and miss for gowns, you really have to find out all you can about the condition of the item. I’ve also found hysterical gowns in Macys Juniors Department. You can buy an expensive gown at any department store. There are also specialty boutiques that specialize in gowns but, if I’m going to drop a hunk of cash, I want it to help a cause as well. That’s why I recommend Helpers House of Couture. The purchase of a gown from them helps the developmentally disabled. You can shop with them online or by making an appointment at their San Francisco boutique. This gown was over $350, but worth it because it’s fully beaded, fully lined, and well made. Some of the cutest, most interesting gowns I’ve ever seen have been made from scrap materials. Check out these gowns made from duck tape. If I have the time I might build one for myself out of news paper, or doggie pee pads, held together with duct tape. Remember, Gown About Town is all about fun so have a blast putting your outfit together and I’ll see you there.